There are definitely enough bonus rounds to keep you entertained with the wild black belt actions of Mr Karate Pig. The more bonus rounds, the more coins so, everyone’s a winner. In another graphic feat from Microgaming, Karate Pig karate chops the ball out of the court. With bonsai tree cutting, the pig in the karategi, a cute Mogwoi type character and something that looks like Shredder's master, the Japanese style up-beat music will transport you into a whole new world. 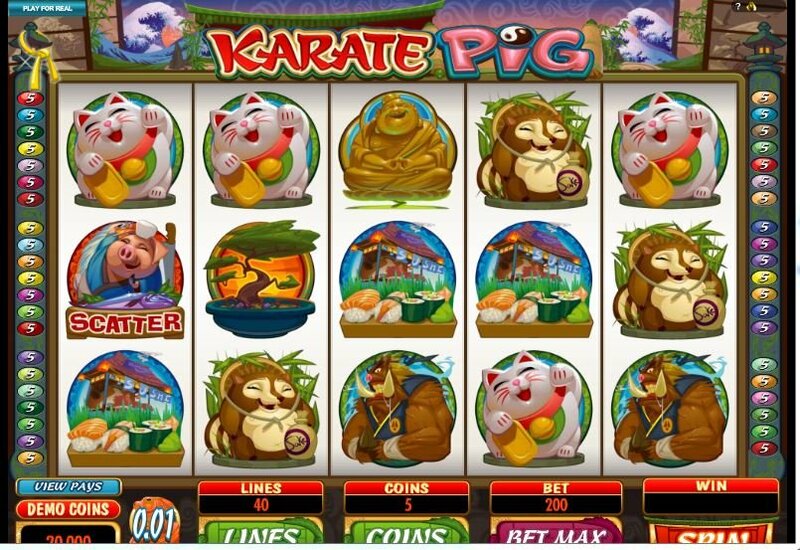 Buddha makes an appearance in Karate Pig slot, much to my amazement. I suppose you must have the yin and the yang though and, the peaceful loving creature is there to offer an alternative to Karate Pigs karate kicks. Despite it never being a good idea to exercise after a meal, there are sushi rolls to be found mixed in with the whole Japanese themed reel. If you are lucky enough to spin three scatter symbols, you will be able to earn yourself a Pork Chop Bonus or Hammer Bonus. In the Pork Chop Bonus you will be led to overhanging barrels and will need to pick three if you pick fish, Mr Karate Pig will chop suey the fish into a delicious looking plate of sushi for you. If you hit the wooden sticks and paper, he will expertly karate chop your chopsticks into being. 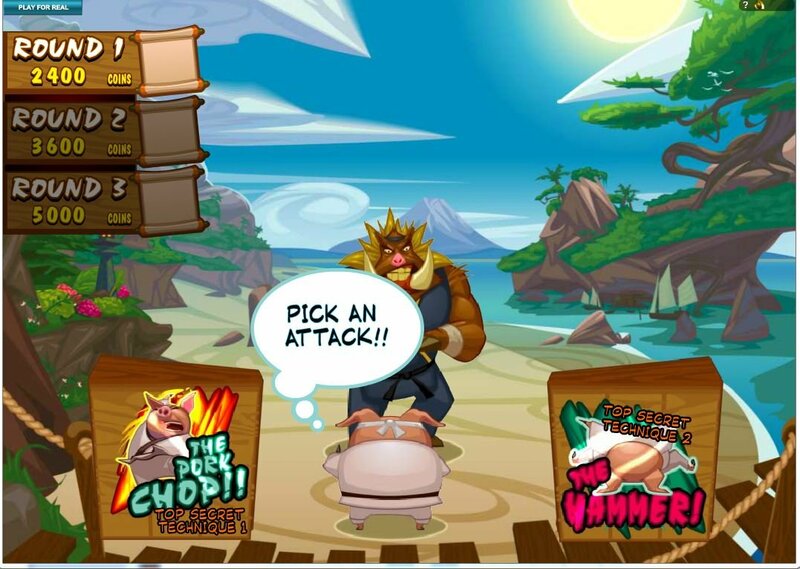 If you complete both bonus moves, you will win your black belt and, Karate Pig will enter the arena to choose between The Pork Chop and The Hammer, two of his top secret techniques in order to beat his big, tough looking opponent in a match to defend his honour. This Karate Pig bonus game is a real treat and had me giggling away watching Mr Pig make his moves. This pigs a fighter! If you are lucky enough to spin three scatter symbols, you will be able to earn yourself a Pork Chop Bonus or Hammer Bonus. Spin 2 gold coin symbols on reels 1 and 5 and net yourself 15 free spins in a move that could make you up to 800,000 coins. Only the same amount of lines you bet in the game that triggered the free spins will be played. 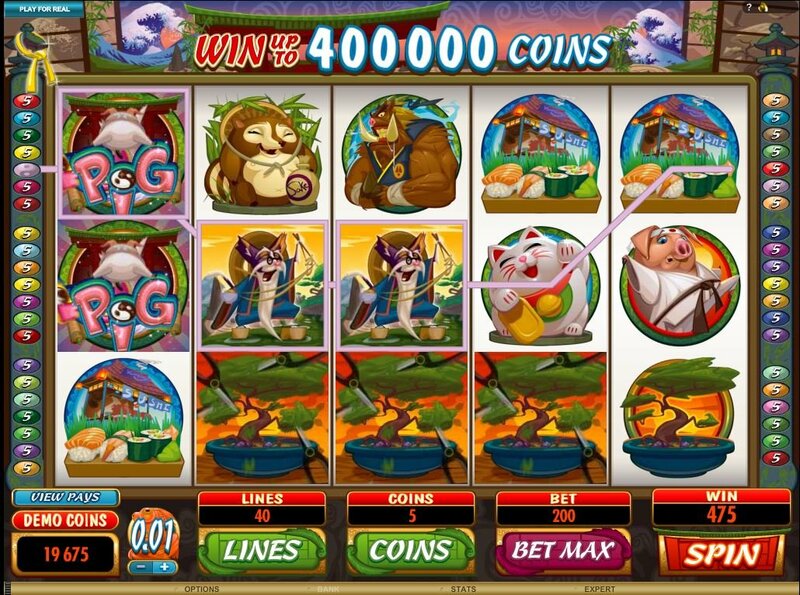 In a move of precision, all wins during these free spins are doubled.